Upon moving to the UK from Spain, founder Paloma wanted to combine her passion for healthy food, cooking and tiny things. 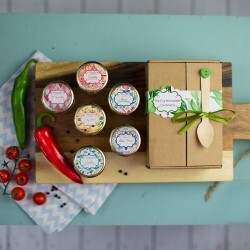 She launched The Tiny Marmalade from her home in Devon, in October 2013. All our their jams are made following the traditional open pan method, like grandma would have done it. 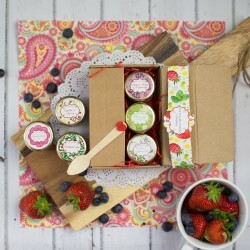 They select seasonal, fairtrade and locally sourced ingredients to create a wide range of low in sugar high in flavour jams that, over all, are made with love and care. 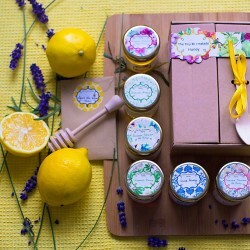 Fruits, herbs, leaves, peels, sugar and scents are softly preserved and carefully packed so each one of their marmalades is a limited edition that will probably not be repeated. 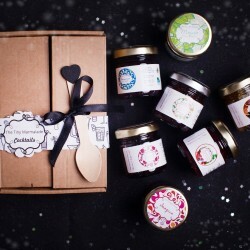 The Tiny Marmalade produce a wide range of jams, marmalades and preserves from the fruity and ordinary, to the weird and wonderful. They have won the Fairtrade award, have been featured in Vogue as the 3rd most recommended Foodie Christmas Gift and have taken part in the BBC Good Food Shows.